Wild: The best adjective to describe Canis Maxdirus is "scary". This pack-hunter is a cunning and brutal predator, capable of taking down prey of nearly any size. In addition to being a vicious hunter, it is the size of a small horse, meaning even the largest predators aren't necessarily safe from the packs. Domesticated: Obviously, Canis is an amazing battle mount. It is fairly fast, very strong, and agile. It can jump almost as well as the Island's battle cats. Riding a supercharged "Alpha" Canis into battle at the head of a bloodthirsty pack is a thrill for which most warriors would gladly proclaim: "Today is a good day to die!" Known Information: The species has an incredible affinity for teamwork. 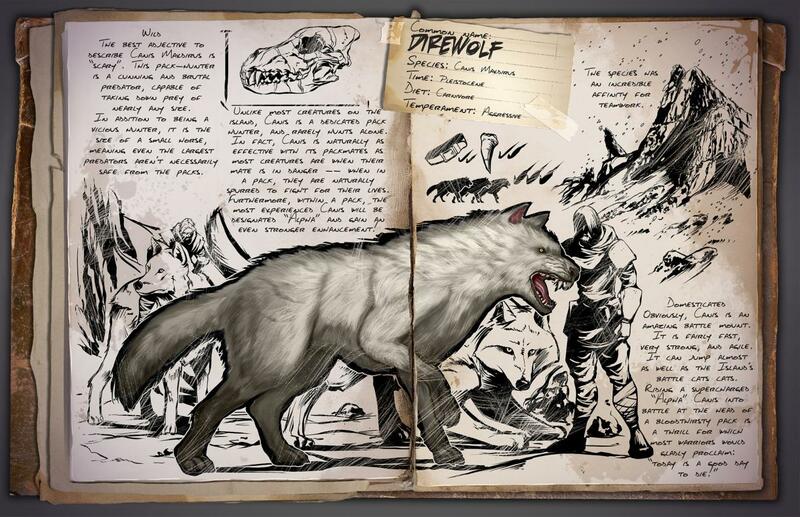 Unlike most creatures on the island, Canis is a dedicated pack hunter, and rarely hunts alone. In fact, Canis is naturally as effective with its packmates as most creatures are when their mate is in danger--when in a pack, they are naturally spurred to fight for their lives. Furthermore, when in a pack, the most experienced Canis will be designated "Alpha" and gain an even stronger enhancement.